Mary Help of Christians' 2018-19 Science Olympiad team, which won the regional competition and will compete at the state level next, consists of sixth graders Mila Bond, Oscar Doughtery, and Zoryn Jean; seventh graders Zachariah Dookhan, Julia Dybas, Elizabeth James, Lucas Opperman, Nathaniel Pistorius, and Miguel Villareal-Rojas; and eighth graders Lucas Benitez, Grace Cavarretta, Melissa Dixon, Rafael Opperman, Victoria Servideo, and Thomas Zambrano. They are led by teacher Donna Hanrahan. 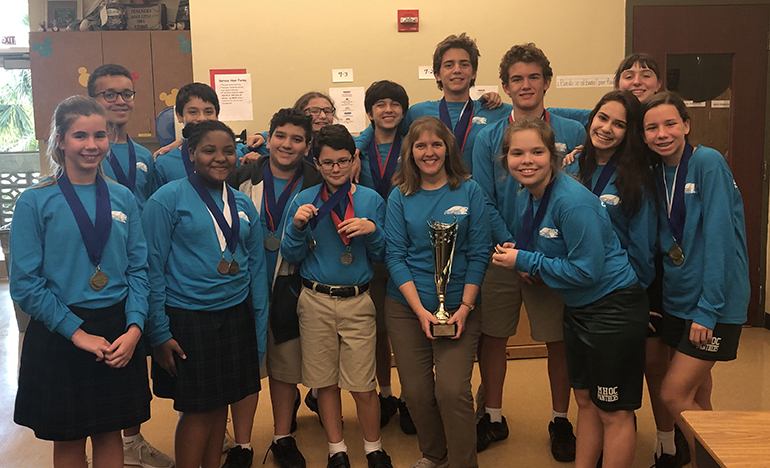 PARKLAND | Mary Help of Christians School's Science Olympiad team, competing Jan. 26 at the Regional Science Olympiad held at the University of Miami, came home with a total of 14 individual medals and a first place overall as a team. The competition pitted both public and private schools from Broward and Miami-Dade counties. Mary Help of Christians' performance qualified them for the state competition at the University of Central Florida March 30, where they will face 42 of the top schools from throughout Florida. "We are proud of our students, and we thank Mrs. Donna Hanrahan for her ongoing dedication to our school’s science program and our team's parents for their ongoing support," said Mary Help of Christians Principal Alexandra Fernandez. "Way to go, and good luck at State!" The Science Olympiad team consists of sixth graders Mila Bond, Oscar Doughtery, and Zoryn Jean; seventh graders Zachariah Dookhan, Julia Dybas, Elizabeth James, Lucas Opperman, Nathaniel Pistorius, and Miguel Villareal-Rojas; and eighth graders Lucas Benitez, Grace Cavarretta, Melissa Dixon, Rafael Opperman, Victoria Servideo, and Thomas Zambrano.